"The biggest secret of this box is that it will offer you infinite hours of amazement." "For me, João is a Genius. The ghost that hides inside into this box is a part of his brain... so brilliant!" "This is amazing! Finally, a Haunted-themed prop that actually does its job right. Everyone jumps!!!" "A fantastic, easy-to-do piece of magic, limited only by your imagination." 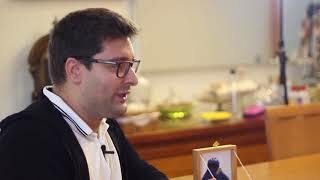 "Once again, João demonstrates innovative thinking, taking an old premise and giving it a totally new coat of paint!" 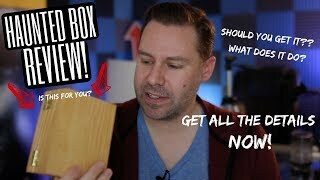 From the creative mind of João Miranda comes the Haunted Box, a very clever illusion with a storyline that is guaranteed to amaze your audience. The magician displays a simple wooden box, purchased several years ago from an antique shop. The magician explains that when he arrived home and opened the box, he noticed a faded picture of Harry Houdini, "The King of Cards." This picture wasn't in the box when he first purchased it. From time to time, the magician noticed the box would produce strange noises at night, a "slamming" sound, as if the spirit of Harry Houdini haunted it. He opens the lid and removes a deck of cards and a standard Sharpie Pen (or pen of your choice). 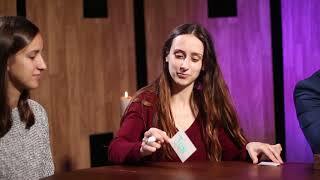 A spectator is invited to select ANY card from the deck and sign its face. The card is then placed ANYWHERE in the deck by the spectator. This is a 100% FREE choice. 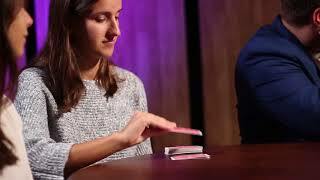 The spectator then mixes the cards and is asked to deal them, one by one, into the box. SUDDENLY the lid of the box SLAMS SHUT, as if telling the spectator to stop dealing. 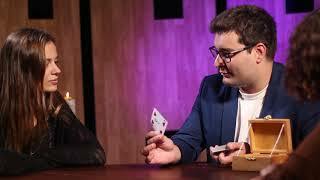 The magician asks the spectator to turn over the card they are holding in their hand... it is the signed card! Haunted Box comes complete with everything necessary to get started performing this miracle right out of the box. This very special box allows you to concentrate on your presentation as it is 100% self-working. The Haunted Box is perfect for close-up, yet plays big enough for any stage! 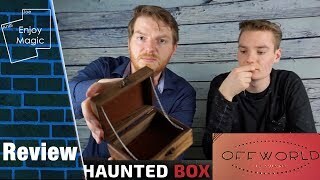 The Haunted Box is the PERFECT closer to your show. There are 100% NO forces of any kind! The magician can be outside the room while the cards are dealt into the box! Add Haunted Box to your repertoire and be ready to amaze your audiences with this spooky and powerful magic effect. Comes with a red and blue Bicycle gimmick. A box that closes by itself! Amaze your audience TODAY with this self working miracle.